Some of you may notice the lack of posts yesterday. This was due to me not being able to access the computer, since I had lost my keys... a long story I won't bore you with. All the fuss over these lost keys led to me forget that it was in fact fireworks night. Since I might be going to a belated bonfire night this Saturday in Salisbury (where 90's legends Dodgy will be also be playing) I decided not to venture out last night, and spent a cosy evening in the musical company of Metamono, Gentleman's Dub Club and SCNTST instead. So since I really did miss all the fireworks last night, this fantastic bit of vintage Idlewild seems like an apt choice for today. 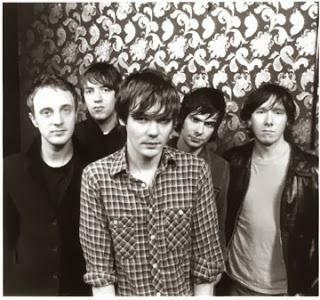 A recent bit of Idlewild related news comes after a three year hiatus... Roddy Woomble confirmed that the band are in the process of writing a new album, stating: "I have been getting asked about this a lot recently, and it is no secret that Idlewild are making a new album (There are some photographs of a recent writing session in a Hebridean cabin up on the Idlewild Facebook page) it is being written and recorded slowly and intermittently, and I have no idea when it’ll be done. Not for a while. I’m just enjoying the process. It is always great to work with Rod and Colin, we have been making up songs together since 1995 – not far off 20 years! Gareth and Allan have not been involved much so far due to both their other touring commitments, but they will be in time, as will others."